This interesting and unusual name is English. It is locational from a 'lost' medieval village called Hollingside or Holmside in County Durham. The derivation of the name is from the Olde English pre 7th Century 'hole(g)n', holly and 'side', side of a hill, thus 'the dweller at the Holly trees to the side of the hill'. The change form 'side' to 'head' seems to have occured in the 14th Century. The phenomenon of the 'lost village' was a result of forced land clearance for sheep pasture in the Middle Ages, as well as the more natural causes such as plague and war. It is estimated that there are Seven to Ten thousand lost villages and hamlets. 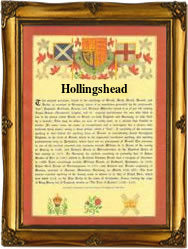 One Richard Hollinshead son of Hugh Hollinshead was christened in April 1678 at Gateshead, Durham. The first recorded spelling of the family name is shown to be that of Richard de Holineside, which was dated circa 1220, Charles of Durham, Priory, during the reign of King Henry III, The Frenchman, 1216 - 1272. Surnames became necessary when governments introduced personal taxation. In England this was known as Poll Tax. Throughout the centuries, surnames in every country have continued to "develop" often leading to astonishing variants of the original spelling.